Well, the Ford Government’s first budget is out. 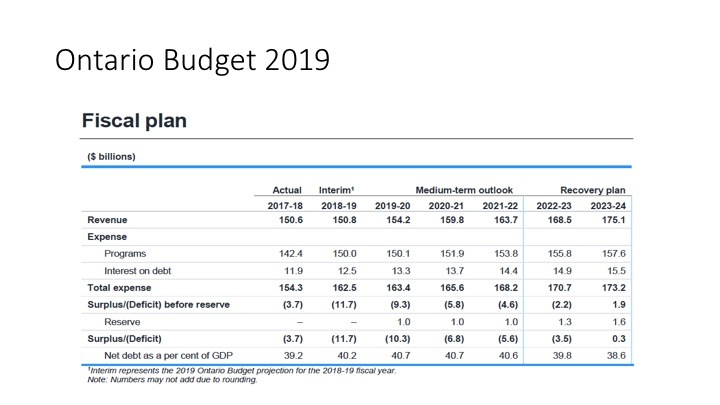 Detailed analysis of the new fiscal numbers takes time but for now, some quick preliminary thoughts on what I think will ultimately be a positively received budget by the Ontario public despite the criticisms that will be leveled by both the right and left of center critics. This positive public reception is not just because of popular new measures in alcohol, gaming and cannabis – such as earlier starts to establishments - that will facilitate consumption. The right will argue that the move towards fiscal balance is not occurring fast enough. Moreover, Ontario’s debt pile is projected to grow past $343 billion to reach $360 billion with an accompanying increase in debt service costs. Meanwhile, the left will emphasize any harm to services from reductions needed to find public sector efficiencies. Indeed, the lead up to this budget has seen some particularly vociferous commentary about the “storm” coming to Ontario and the "apocalyptic" cuts coming to public services. Yet, many middle of the road Ontarians may probably find this to be a reasonable budget that is less harsh than many expected. After all, spending is still going to be up slightly next year – from $162.5 billion to $163.4 billion and then to $165.6 billion the year after. With signs the economy may be slowing down, the government is certainly not keen to worsen any potential downturn with a slash and burn budget. However, the next four years may also be one of the most transformative periods in recent Ontario public finance if the government succeeds in implementing its vision to better manage Ontario’s public sector while maintaining services. The Ford government is expected to end 2018-19 with an $11.7 billion deficit and is bringing in the 2019-20 fiscal year with a $9.3 billion deficit with plans to balance the budget by 2023-24. With respect to fiscal progress, the Ford government could have balanced the budget in about three years if it had decided to freeze nominal spending for a couple of years. Instead, it is planning to allow total spending to grow at about one percent annually which is still very restrictive relative to the projected increases of the last Liberal budget. Spending in Ontario is being placed on a much lower growth trajectory so that over time it will eventually match revenues. Given that compensation is a big part of public sector spending in Ontario, the one percent number is a signal of what wage increases can be expected in the public sector. After inflation, real spending in Ontario will nevertheless decline and therefore there will need to be choices made on where greater reductions and efficiencies will occur. However, some of those efficiencies will be used to fund new initiatives whether they be dental care for seniors, a new child daycare tax credit, opening new long-term care beds on a faster schedule, investments in public transit, and ultimately even some tax relief down the road. More specifically, despite creating a new single health agency and optimizing productivity, over the medium-term health sector spending is still expected to grow an average of 1.6% annually to 2021-22. Education is expected to grow 1.2 percent annually. On the other hand, post-secondary education and training is expected to decrease at 1% annually and while justice, and children and social services, will each decline at about 2% annually. In terms of efficiencies, aspects of the government plan are going to take shape via coming expert panels and task forces. Education is a key area with changes in class sizes the first step that was taken. A task force to find efficiencies in how the four systems operate will inevitably lead to suggestions for more coordination of procurement and spending across school boards, standardization of pay scales and perhaps even some type of consolidation of facilities in declining enrollment areas as well as administrative and management functions that preserve the distinctive nature of each system. Then there is post-secondary education where the budget has communicated a desire to tie college and university funding more to performance outcomes. The key issue here is what those performance outcomes are going to be. Along with graduation rates and employment success, one might expect to see research output and measures of commercialization success or community outcomes as additional measures. However, Ontario’s post-secondary sector especially at the university level is quite diverse and constructing a one-size-fits all set of measures will be politically challenging given the regional role many universities play. However, where the government will garner more sympathy from the public is with respect to its position on trying to do something about aging university faculty who can continue working past 65 and earn a salary and if still working after age 71 also collect a pension. However, university pensions are not like school teacher pensions – there is no province wide university pension system but each university has its own so again there is no easy one-size-fits-all solution. The government will at minimum need to separate its thinking with respect to those universities with plans that are defined benefit-where the employer bears the risk - from those that are defined contribution – where the employee bears the risk. And then there is health care, Ontario’s largest single budgetary expenditure. Health care in Canada has been looking for transformative change for years and the inevitable result has been more and more spending. The slowdown in growth rates of the last few years may ultimately prove to be temporary, driven in part by a slowdown in new drug products and postponement of capital spending. With a pledge to end hallway medicine and increase the number of long-term care beds, combined with an aging population and the arrival of new high demand pharmaceutical products, any savings found by true transformative change in Ontario will be rapidly eaten up by other spending. This will be the area of greatest challenge. So, there you have it. This budget has a lot of plans for change by implementing reforms and best practices and innovation but for the moment they are just plans. Politics is the art of the possible and the next couple of years will reveal what is possible and what is not. Much hinges on how the economy performs, and especially whether we go into a small recession. If the economy does better than expected and revenues are buoyant, the government will be able to shrink the deficit more than expected and spend more money. Angst generated for media purposes and twitter universe rants aside, I think a sizeable silent chunk of the Ontario population will give the provincial government the benefit of the doubt for now. Mayor Bill Mauro has gone public in his calls for help in dealing with crime in Thunder Bay. In reports by Thunder Bay Television and the Chronicle-Journal, the Mayor has called on the federal and provincial governments for assistance in dealing with the spike in violent crime that is afflicting Thunder Bay. The City of Thunder Bay is hard pressed to deal with the financial impact on the police budget of the recommendations made by the Office of the Independent Police Review Director (OIPRD) to deal with systemic racism and now the spike in gang-related violent drug crime that is underway. Thunder Bay is experiencing a surge in violent crime that has been underway for a number of years. 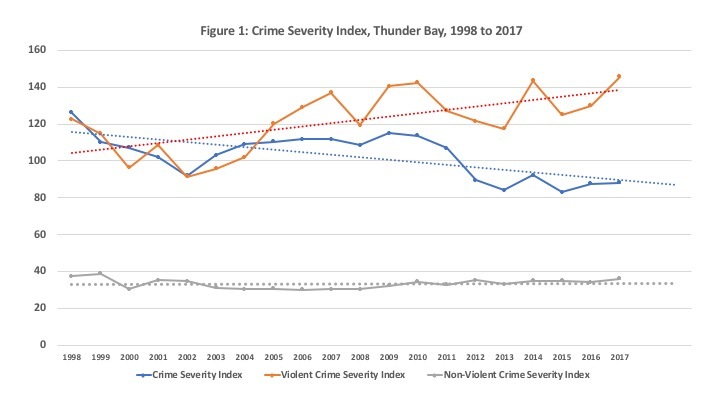 While overall crime rates are down in Thunder Bay as shown by overall traditional crime rates as well as the Crime Severity index, violent crimes are up. As Figure 1 below shows, overall crime as measured by the Crime Severity Index (Source: Statistics Canada) has fallen from a peak of 126.25 in 1998 to reach 88.25 in 2017. Violent crime, however is at 145.81 in 2017 and was 122.62 in 1998. When linear trends are fitted to the data, violent crime has been trending up over time while overall crime severity has been trending down with non-violent crime severity quite flat. The Financial Accountability Office of Ontario recently issued a report called Incomes in Ontario: Growth, Distribution and Mobility which summarizes recent trends in personal income in Ontario in the areas of income growth and distribution. Among the findings were that Ontario’s median income growth was the slowest among the provinces between 2000 and 2016, that there has been an increase in income inequality in the province, and that relative and inter-generational income mobility has declined – that is over time, it has become more difficult for lower income Ontarians to move up the income distribution and that children of higher income parents are more likely to become high income earners themselves. As the report states: “It has become more difficult for Ontarians to “get ahead” – that is, move up the income distribution. In this report, upward income mobility is defined as the share of working-age Ontarians who move up at least one income quintile over a five-year period. This share declined from 41 per cent in the early 1980s to 32 per cent more recently. The decline was most pronounced for lower-income Ontarians.” Moreover, what is also of interest is that while Ontario’s productivity has grown, incomes have not kept pace suggesting that Ontario’s economic growth has not translated directly into increased personal incomes. 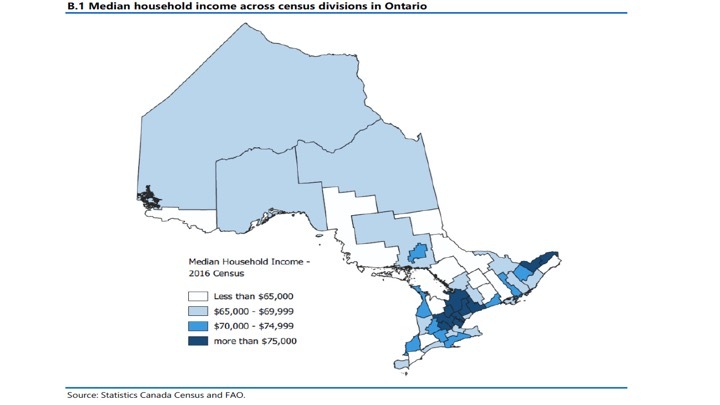 Much of this report focused on Ontario wide trends but one of the most interesting pieces of information is Figure B.1 in the appendices - a map titled Median household income across census divisions in Ontario. In this map, median household income from the 2016 Census is plotted by major census division in Ontario in four categories – Less than $65,000, $65,000 to $69,999, $70,000 to $74,999 and finally more than $75,000. The map taken from the report is shown below and illustrates Ontario’s great regional economic divides. Ontario’s highest household income regions stand out as mainly two islands on the map – the area surrounding downtown Toronto – that is the GTA and central Ontario – and the Ottawa region. Downtown Toronto itself has substantially lower household incomes than the surrounding GTA and GTA belt area. The east and the southwest have swathes of lower income areas and then there is the North. Well, in the wake of the release of the 2019 Budget, Prime Minister Trudeau is off to Thunder Bay where he will be hosting a Town Hall on the campus grounds of Lakehead University on Friday March 22nd. Indeed, the preparations for his arrival are already underway as the grounds of the C.J. Saunders Fieldhouse where the event will occur are being swept and tidied up from the accumulated grit of a harsh winter. This is apparently Trudeau’s first visit to Thunder Bay since 2016 which is a signal that the election campaign is already underway. The festivities get underway at 7 pm (but if you want a front row seat you need to register and arrive by 5:00 pm). Thunder Bay can be considered a relatively politically safe place for the federal Liberals to have a Town Hall given the two ridings have returned mainly Liberals to Ottawa for nearly 100 years. Thunder Bay voters are actually very conservative voters in the sense that they dislike change and always do the same thing – that is, return Liberals to Ottawa. The only way they deviate from their inherent conservatism is to actually vote Conservative. Indeed, the last federal Conservative party politician who was elected was Robert Manion, who if memory serves me correctly, was around in the 1930s. Of course, there was MP Joe Commuzzi circa 2007 – who started as a Liberal but then switched to the Conservatives and served as a Minister– but he was not elected as a Conservative so my initial point stands. So what issues will Prime Minister Trudeau have to face in Thunder Bay? Well, the audience is likely to be filled with gushing supporters who will hang on his every word and engage in numerous standing ovations despite the recent disillusionment over the SNC-Lavalin-Raybould Affair. Indeed, the Prime Minister is probably looking forward to an evening’s relief from the stress and acrimony of Ottawa. There is nonetheless the potential for some fireworks and charged questions on a number of topics should the Town Hall decide to deviate from what is likely to be a large pep rally. For those who might be interested, here are the parameters of just two interesting question areas. What is the Federal Government going to do to help Thunder Bay address the December 2018 report by the Office of the Independent Police Review Director on relations between Indigenous People and the Thunder Bay Police Service? It is true that the local police are a municipal function and municipalities are creatures of the provinces, but it remains that First Nations and Indigenous peoples are a very important responsibility for the Federal government. The recommendations for the Thunder Bay Police Service are going to involve a substantial increase in expenditures on an already stretched municipal tax base. Is there any real federal financial assistance coming or is Thunder Bay on its own in dealing with this? Indeed, given that Thunder Bay is a regional centre for health and education services for area First Nations, what can the federal government do to assist in this regard? As well, what is the Federal Government doing to actually implement its own growth plan for the Northern Ontario economy? 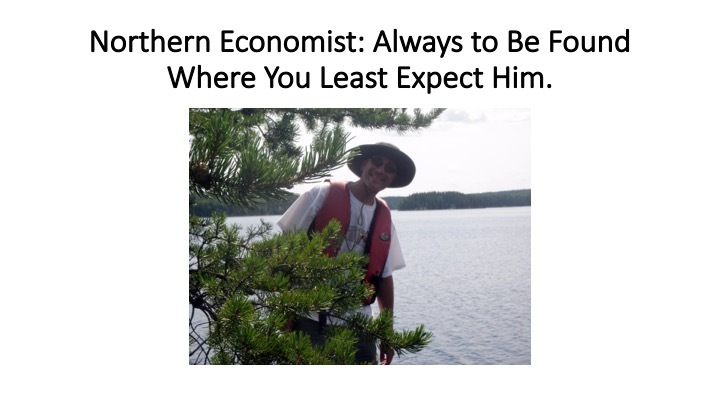 All of us are familiar with the 2011 Northern Growth Plan released by the Ontario Liberal government which, over the course of the next 25 years, was supposed to assist the North in reversing its economic decline. Well after five years of the provincial Northern Growth Plan – the plan to end all plans – the population of the North remains flat, employment is down and the value of new investment is also down. This lacklustre result has not deterred the Federal government from announcing its own Prosperity and Growth Strategy for Northern Ontario in April 2018 with twelve areas of action. However, since then there really has not been much to be seen and heard as to specifics of what this strategy entails, aside from mentioning the strategy whenever there is an announcement of federal money from FEDNOR as was the case in Sudbury in December 2018. Aside from this, there is little to be found in a Google News search when the term "Prosperity and Growth Strategy for Northern Ontario" is typed in. So, is there an actual Federal action strategy for Northern Ontario or is it just another election marketing ploy? I guess we will have to wait until tomorrow night to see if we learn anything new. I for one expect there will indeed be some entertainment involved in this Town Hall Meeting. Who knows, maybe we'll even get yet another announcement of federal support and commitment for the Ring of Fire? At the very least, in an election year one might expect some federal infrastructure dollars to finish four-laning the highway to Nipigon. Thunder Bay Mayor Bill Mauro has called for an organizational review of how the City conducts its operations and has directed the City Manager to prepare a report that will deal with the scope of the proposed review. This is in the wake of a 2019 Budget that saw the new council come in with a total tax levy of 2.29 percent which is below the annual average increase of the previous council’s four-year term of 3.6 percent. However, there is room for improvement and an organizational review is a good way to try and put the city on a more sustainable tax levy path. The BMA 2018 Municipal Study (see below) provides some quick comparisons in its Executive Summary that show why Thunder Bay needs a longer-term strategy to keep future increases closer to 2 percent. 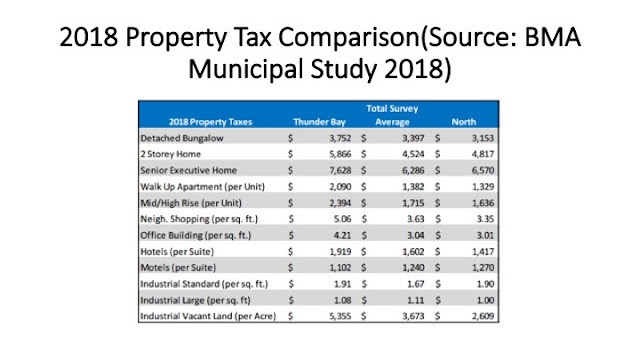 A property tax comparison shows that for the most part, property taxes in Thunder Bay are higher than either the provincial average or the average for northern Ontario. A basic detached bungalow has property taxes that are 10 percent higher than the provincial average and 19 percent higher than the average for northern Ontario. For a two-storey home, Thunder Bay is 30 percent higher than the provincial average and 22 percent higher than the northern Ontario average. 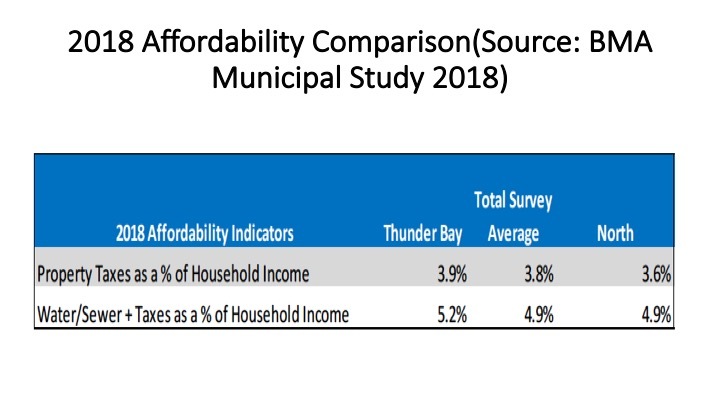 It should be noted that house values in Thunder Bay are substantially below the current provincial average - which incidentally in January 2019 was $554,936 while in Thunder Bay for February 2019 it was closer to $256,000. [Had to calculate this myself as the Thunder Bay site reports the median but not the average. Take 13.8 million dollars and divide by 54 sales]. A homeowner in Thunder Bay pays anywhere from 10 to 30 percent more in property taxes than the provincial average for a home that is about half the value. How's that for the Thunder Bay competitive advantage when it comes to attracting new business? Our property taxes on apartment buildings are also higher than the average for the province or the North as are those for neighborhood shopping malls, office buildings, hotels, vacant industrial land and standard industrial land. The only categories where we are lower are motels – where we are 11 percent below the provincial average and 13 percent below the northern average – and large industrial land – where we are 3 percent below the provincial average but 8 percent above the North. This raises questions of long term sustainability of these taxes given the slow economic and population growth in the City as well as the affordability when it comes to households paying these taxes. While taxes are levied on the value of property, they are paid out of current income and here Thunder Bay also does not perform as well. The slide below continues the comparison but this time on property taxes as a percent share of household income and water/sewer charges plus taxes as a percent share of household income. For both these measures, we are higher than the provincial and northern averages though one may argue that the percent difference is small. Average household income in Thunder Bay was $87,359 (the provincial average for municipalities in the BMA study was $102,194) with property taxes (at 3.9 percent on income) representing $3,407 dollars. At the provincial percent share, taxes would be $3,319 - $88 dollars less - and at the northern Ontario percent share it would be $3,145 - $262 dollars less. If our property taxes were as affordable as the Northern Ontario average - each household would pay $262 dollars a year less. Why do we have higher taxes? That is the type of question a good organizational review would help answer. When you start looking at the cost comparisons for services like general government, ambulances, general assistance, assistance to the aged, parks, sports and recreation, library, cultural services, police, and fire, Thunder Bay is usually at the higher end of the cost rankings for comparison Ontario municipalities. While we can make arguments that the higher costs are a function of the geographic spread of the city, its regional role or its aging demographics, it remains that our costs are higher even when compared to other northern Ontario cities with similar features such as Greater Sudbury or Sault Ste. Marie. At the same time, the evidence suggests that we are increasingly providing a regional role in terms of health and education services and servicing a population larger than the official statistics might indicate. Every year, thousands of university and college students move to Thunder Bay to acquire their education boosting our population from September to April. Then there are the outlying First Nation communities who come to the city to also get health and education services many of whom also stay for extended periods to access these services. However, how much more additional municipal service provision results from these demands that have to be met by the municipal property tax base is not a question with ready answers due to a lack of data - or at least publicly available data. There is only so much a simple country economist can analyze if the data is not available. So, an organizational review is a good thing if it takes a look at how things are currently being done as well as what the actual demands for municipal services in Thunder Bay are. If we have a municipal tax base for a City of 110,000 but are servicing a more regional population of 130,000 then we need to find some solutions. An organizational review is not about cutting service but how to meet our current and growing needs and doing it in a manner that does not fiscally punish residential households and businesses in Thunder Bay. Its about how to do more with less. Simply throwing up your hands and saying taxes are higher here because things cost more is not really an option. Things cost more for a reason and the organizational review should find out why.